The team uncover valuable collectables at the home of a lady who wants to raise money at auction to pay for the restoration of her parquet flooring. Luckily her son's a handyman. Browse content similar to Carter. Check below for episodes and series from the same categories and more! Today, I'm in south London, where I've stopped at Morden Hall Park. It'll be a busy day, so I'll be making the most of these beautiful grounds before we get cracking. has been used as a family home, boarding school and a military hospital. which were much used in the 1800s for the tobacco trade, but were eventually closed in 1922.
to educate local school children in the art of bygone manufacturing. that will get the bidders excited when they go under the hammer. It looks like something out of the Hammer House of Horror! I love the nose pinchers(!) Yes! I didn't at the time! ..and when we go to auction, it's torture. Are you crying? Almost. Oh! But will it be pleasure or pain when the final hammer falls? who have called in the Cash In The Attic team to help give the family home a new lease of life. to lend a hand and sift out enough collectables for some long-overdue maintenance work. have lived here so there should be some original furnishings. Let's get inside. If you have a look at everything that is available to sell, I'll meet the family. Ah, good morning. Oh, good morning! Nice to see you. Nice to see you. You've called us in, you've got people to help. This is Alan, my son, and my daughter, Maria. and also the fireplace lightened up, as it's a bit dark and heavy in there. Who'll be doing that? My son is going to do that, I hope. Yep, I've been roped into it! All right, OK. Helps make the money go a bit further. That's right, yes. where has all that stuff come from? A lot, my husband collected. he would find them in skips, he'd go to jumbles, second-hand shops, the charity shops, antique fairs. If he died a year ago, how do you feel about...? He used to say, "You can...", you know? And also, I always wanted to size-down. In terms of the renovations, what sort of money are you looking to raise? which would make a start for doing other things to the house. It needs a bit of upgrading. Well, we better get started, so, shall we go? 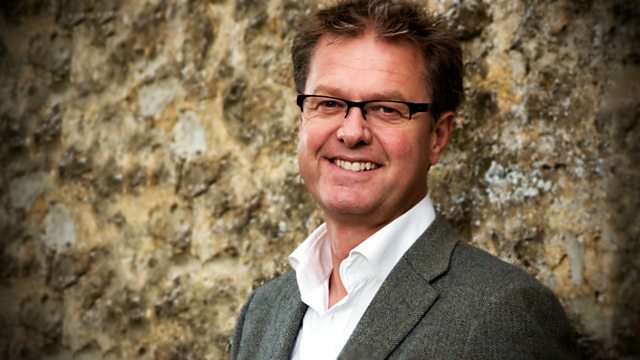 and our expert Jonty Hearnden holds all the knowledge when it comes to fine antiques. Ah, Jonty, reading up already, are you, on the day(?) No, I'm looking at the bookcase. OK. Very impressive. Now, I know your grandparents bought this house new, but what date was that? so they would have brought this to the house? Yes, that's right. and there's a few indicators that will tell us the reason for that. and you have this acanthus leaf decoration, now, that is a 19th-century concept. The construction is very, very classic, British design. where there are usually two doors and two drawers as well. If we have a closer look down here, the brass drop-handles. This style of handle is very popular on furniture dated around the late-19th century periods. What are we talking about, in terms of going to auction? I mean, the piece has got to go. we have to be sensible on price. Where auction value is concerned, at the moment, the price for this will be between ?150 and ?250. It would be nice to have more, but we all say that, don't we? I think it's got to go. They're not fashionable any more, are they? and takes us well on the way to our ?600 target, and the revamping of Julie's dining room. If the rest of the treats we unearth are as good as that, we'll have the new floor laid in no time. with its estimate of ?40 to ?60. While Jonty can't believe his luck with the classic British timepiece he's got his hands on. Julie, are you up there? Yes. Look what I found. Oh, yes. Yes, that watch. Yes. Who did this belong to? That belonged to my husband's brother. OK. I don't know if you have noticed, can you see there, it says, Tudor? Oh, yes. Yes. Can you see that? Yes, I can. OK. This - nobody is listening - is made by Rolex, the company. Right. Oh, I see. Yes. So, very exciting news. Yeah. so this came out in 1946, the name, Tudor. So, it is obviously post-Second World War, this, but it is probably an earlier version. it had all the resonance of quality. You're talking British Tudor solidity. The gold body IS gold... Yes. ..but because it's not hallmarked, it's quite difficult to say exactly what. But, still worth selling. Yes. Value in the market today, I think we're looking at between ?100 and ?200. Very good. Yeah? Exceedingly good. So we can... Time to sell? Yes. Time to put it back in the box. It will only sit there... Very good. ..for another, I don't know how long. I'll leave that there. But, one for the auction room. OK. Lovely, thank you very much. Another family heirloom to boost our fund. and are worth at least ?80 to ?150 to us. But it's Julie's late husband Dave who is mainly responsible for filling up their home with delights. When he wasn't working as a carpenter, he was housing his hoards. Tell me a bit about your husband. When you met him, how old were you? I was still 16, almost 17 then. And how old were you when you got married? 18. Was he always a collector? Not really. It was a gradual thing I think, you know, and, got more interested. he never wanted to let go of anything any way, you know. "Yes, yes, I'll have that", whether we had room to put it any way. What sort of things did he bring back to the house? Bits of silver and things he found in skips. He found a load of notes once. I assume your husband had a good eye, one way or another. Yes. He picked them up for interest. He never thought they'd be of value. Did you ever take up the same habit? No. How did you remain immune? I would like things, but I would often say, "I like that" and he would want to buy it. I like castles and stately homes, but I don't want one. because you have inherited the house as is? the bookcase particularly for, what, 44 years, haven't I? The family took out what they wanted, and I, you know, had what was left. OK, well, if it's time for some of it to go, shall we get back in and get going? we'll need to find plenty more treats. with this mixed selection of hallmarked silver pieces. which could spice up the sale room by a very reasonable ?30-?40. useful when laying floors but could easily chip into our kitty. Hello, Jonty. Look what I've found. Is that your lunch? No, it's a box of chisels. who said he would give them to him when he retired. And that's what happened. Can we take a closer look at one? There should be a name on one of the blades. There's names on all the blades. What have we got here? There is a complete set. JB Addis Sons. and he started making carving tools like this in the 1870s in Sheffield. The reason people collect them is because they're made of such high-quality steel. They are beautiful objects, so there's a big collecting market for tools just like this. We're not talking very old here though, these are certainly 1920s, 1930s. If you look at the stylised handle, that's the reason why one is dating it. If they were 19th century they would be worth a bit more. They are housed in their original box. and the great thing is the whole tool collection is intact. Very conservatively you're talking between ?60 and ?80. Is that good news? Yes. Very good. Fantastic. I'll put that back. Right. And we'll go onwards and upwards. Let's go back through there. The box of chisels, never came out of the cupboard. They just stayed in the box. and would put them away again. He isn't here to look at them so they may as well go to someone who will enjoy them. so we need to uncover some more rich pickings. one of the first children's programmes to be broadcast live. They might give the bidders food for thought at a collective ?30-?50. As could Maria's next discovery. What have you got there? and he said they were nose pinchers and pinched my nose. I can see where he was coming from! So, where they ever used in the house? because Mum was fed up with everything that he kept bringing in. So she would put them away in the cupboard. A bit of a hoarder? He was, yes. A bit of a magpie. Definitely. These are fantastic quality. Solid silver. around the turn of the century, Edwardian set of asparagus forks. That is charming. That's a scallop shell. and again that is turn of the century. Yes. So an Edwardian lovely scallop shell butter dish and knife. All in the original presentation box. This one. That's lovely. And look, cracking hallmarks as well. looks like that serving spoon and fork have never been out. Yes. It's not worn at all. That's really good quality. You want to sell the lot together? Yes. Value? We are looking round the ?100 mark. I love the nose pinchers(!) Yes. Let's see if we can find any more. OK.
and all these bits and pieces are inching us closer to that ?600 and Julie's luxury new floor. Yes. Jonty, look, I found something intriguing. Is there anyone in the family who has been a doctor or anything? No. It was... We assumed it was my grandfather's. in the floor of the bottom of a wardrobe. and the name here is fascinating. Can you see the maker's name, Ediswan? It was the Ediswan name that first produced the commercial light bulb. because it looks like it's not been used. It looks like a dangerous item to even get out. It looks like something out of the Hammer House of Horror films, actually. but look at these heads, they look quite sinister. I really don't think I want to get anywhere near it. So if we take this glass head for instance. I mean, is that for the head? It looks really scary to me. It's like a rake isn't it? And that would be...I don't know. Do you want to use it? I don't think I would want to touch it. I'll put it straight back. ?40 to ?60. A back massage costs ?40, so I don't know. I wouldn't have thought anything more than a fiver. There you are. Fiver. ?40 to ?60. Somewhere between a fiver and ?60. There'll be someone that collects these things. and tell you the value before the sale? Yes, you can, but only on condition that if that's what we do you test it on the day. That would be too shocking. Shall we do that? Yes. Right. OK. So we will have to wait for the auction for that. that we definitely know the value of. Come on. Right, lovely. and we rake in a decent amount. we need to search the house some more. for regular card games for over 40 years, will deal up a further ?80 to ?120. is bound to have stirred up past family memories. Here you are. Right. Having a bit of a break are you? Yes. Children of the '60s, I see, from that fashion trend. Have you got any in here of the house as it was? The front. The front door has changed. What about inside? And there's here. That's the four of us. Me, Alan. Danny and Lee. Still in the corner and never moved from there. So who is this in these? That is my great grandparents. And have you got any of the stuff in the photographs? Yes, you have this little table. My daughter has this table and I'm selling these vases here. That is a lot of stuff to still have from that. Keeping some. It looks like they were quite well-to-do. Yes, they were. and the carriage would come for them in that evening. and things today then. No. Yes, there were bells in this house when we first came. Each room had a bell on the wall. I remember the bell at the side of that. There was one in the bathroom, you could press the bell. That's the sort of life I could become accustomed to. Let's see what else we can find to sell. if only to reduce the amount of polishing she has to do. although has Julie already been pushed over the edge? I think I will leave Jonty to deal with that. Wow, lovely. What do we have here? We have a label here says "1796 patent officer's light cavalry." So where was this from? It was bought at an antiques fair. Can we take a closer look at it? like this, never hold it like so. Oh, no. Right. can pierce, so let's take it out. There we are. Can you hold that scabbard there for me? Look at that. That blade is in very, very good order. Can you see? And we have got this piped rim to the top of the blade. That is an indicator of date. We are looking at a blade that is a little later than 1796.
and when I mean heavy I mean fully-blown armour in the thick of things. so this label is warm but not exactly correct. Would you have any idea what your husband would have paid for it? I doubt if he would have paid more than ?20, ?25. because this is going to be worth between ?100 and ?150. Very good. Do you think you ought to put it away rather quickly? I think we should before we have any accidents. I assume this is an instrument of torture you wish to sell. Sell what? Have a look at this. We have this English officer's cavalry sword. but it's in such good order it will be worth ?100 to ?150. we've run out of time for rummaging so we've got to make that our last item. because you wanted ?600 for the renovations. Yes. the value of everything else comes to ?830. So there you go. You can do a bit of extra elbow grease with that. That is fine. That is lovely. All we have to do is make sure everything gets safely to auction. The next time we see you all will be at the auction house. Thank you. I've had great fun finding the best items to take to auction. and now being cashed in at ?150 to ?250. collected by Julie's late husband Dave and worth at least ?80 to ?100. For ?100 to ?200 the golden-cased Tudor timepiece by Rolex. whose price will be revealed when we get to the sale room. What did you know that we didn't know? I wanted a bit more. You always want a bit more, Jonty. ..and I think ignorance is bliss. but in this case I think I'll pass. But will we reach our target? Find out when the final hammer falls. we found plenty of items to bring here to Blyth Co in Ely, Cambridgeshire. so she can restore the original parquet flooring in her home. Let's hope when the items go under the hammer today, the bidders are feeling very generous. but they will need to wait in line because our expert wants to check out all our equipment first. Jonty, I'm not into tools but that is a lovely set. Very good quality. the Pelham puppets and that lovely bookcase. And we have the vibrating machine! Yes, well, I don't know whether to get excited about that. You won't tell us what its potential value is. My lips are sealed. Are you looking forward to today? I am. Very much so. I need to meet them. Come on then. and her children and we're all drawn together. I hope that's not due to any underlying current! Fine. Good. I see you have found it already. Yes, that's right. I'm sure no-one will want it. I am dying to find out about this set. So Jonty, time to reveal all. You said ?40 to ?60. Did I? And I said about a fiver. Well, I think, Julie, you're nearest. Because really it's anybody's guess. I put ?20 to ?40 on it, but today we're just going to sell to the highest bidder. It's one of those fun, novelty items. Is there anything you are in two minds about selling? No, not really. No, you look at it and look at it, then you don't look at it for ages. It may as well go somewhere else. So you're ready to go? Yes. so check with your local auction house for details. of mixed valuables which takes to the stand. the salt, pepper, the sugar tongs or nips. What do we want for this particular lot? I put ?30 to ?40 on this lot but it's a dealers' lot so we will see where it goes. back in front at 25, I sell standing at 25. In the middle of the room then at 25, you are out on my right. ?25. Are you happy with that? Yes. That's not bad. Not bad. You always want a bit more, Jonty. Only slightly under-estimate but it's a good start. I hope all the rest of our sales go down as well with the room. but we are not playing around today. We would like ?80 to ?120 for it. 20, 20. 20 only. It's got to be worth more that ?20. 22. 22 here. Done at 22. 25. 28. 30. 35. 38. 40. At 50. You still in? 55. 60. 65. 70. 75. 80. At 95, are you in on the phone? At 95. I sell down here at ?95. Just needs a little glue. It needs a bit more than that! That's fine. I don't know about you, I was having a heart attack when he said 22. I think we only paid ?2 for it. You're joking! Did you really? but the bidders had me worried for a moment. so hopefully our old classic - no, not Jonty - will be snapped up too. This lot is the Tudor gold wristwatch. I put a bottom estimate around ?100. I know, a couple of hundred, straight in. 200, sir? 50, 55, 60, 65, 70, 75, 80, 85, 90, 95. At 95. 100. At 100 now. You out on the phone? 110. Goes then. Standing bid at 115. I hope we're not paying for the call. 115. 120. At 120 now. They're out on the phone. I sell at ?120 in the room. Anyone else? Goes there at ?120. paying another fantastic sum towards her new floor renovations. carve us out a tidy ?60? Let us start low. Ten to start. 10, 12, 15, 18, 20, at 20 now. 22. 25, 25 here. 28. At 32 now. Goes at 32. New money at 35. 38. 40. 42. At 42. 45. 48. Against the lady at 48. I sell there at 48. You are both out up front here. Is that 50? 50. At 50 now. Sell at 50. Take your two, sir. 52. At 55. In the blue. At 55, I sell at 55. Back with the gentleman at 60. I sell then at 60. This side at 60. Very good. Well spotted, sir. and get the bidders delving deep into their pockets. Lot 103 is a brass-cased Schatz marine clock. 10, 12, 15, 18, 20. 22. 25. At 25 now. I sell then at 25. Is that it? Goes though at ?25. All done at 25. Are you in again, sir? You sure? Sold at the back at ?25. At ?25 that's rather unfortunate. Not quite making Jonty's valuation. and we need to be fully-focused for this one. I have to say you did have a lot of brassware at your house. everything has been listed individually. What has happened? and all these next 11 lots are your lots. Collection of brass, I put ?80 to ?120 on the whole lot. Let us see if we can double it. Let's have a bit of fun. Let's watch them go through and add up the total at the end. So, what do you think they will go for? I really hate brass so I think it's worth about a fiver. Alan? Well, in scrap value it's probably worth about ?100. I hope we can get something around that. I hope to get about ?120. ?120. Let's see what we can do. Brass owl. Two, three, four, done at three. Couple of pound then? All done at two. In the middle at four. ?120. Bang on the nose. What did you know that we didn't know? You got that exactly right. That's hard to do, isn't it? I think there is a new saying. Where there's brass there's more brass. and she's ?120 better off. But just how close are we to our floor fund target? but you want at least ?600 for the parquet flooring, don't you? How do you think you've done? Hard to keep track. No idea. We've actually made ?445. Brilliant. I don't know about you but I feel like a well-deserved rest now. So follow me. A break is out of the question though for Jonty, whose mind is always on the job. and whereby you go to people's houses on a regular basis valuing. What in your mind is really hot at the moment and what's not? The hot items at the moment is anything military, particularly medals. in their career then those items are sought after. When you go into somebody's house what makes your heart sink? Jewellery is taking a big dip. Unless it's the best-quality jewellery, it's dipping out. And is it your experience like it is my experience, I am always amazed, stunned by what you see? There's always something very exciting round the corner. I can give you an interesting story. a number of Tottenham Hotspur catalogues that were in year runs. He flew out and came back, feeling very much like a spy, he said. and it was something like ?160,000, ?170,000 they made. And that, to me, is a substantial amount of money. I'm glad you have the same buzz as I do. That is the beauty of the business. Isn't it? Absolutely. I must let you get back to your work. Bye. I think our Jonty has found himself a soul mate! So far the bidders have paid some generous prices for our goods. when they are shown our next item. if you can call it a fun item. It's our shocking item. The electro-massager. Which you have been trying because your hair is rather spiky! Was it good for you? Amazing! A fun little item this. ?10 for it. Ten, I am bid here. At ten now. It goes at 12. 15. Funny it's all blokes bidding on this. At 15 I sell there. At 15 now. Ladies, have a go. Come on, ladies. I sell at ?15. 18. At 18. Fill it up to 20. Over here at 18. Make it 20 now. At ?18, it goes then on my left at ?18. are going to use something for but in this case I think I'll pass! the medical device is packed off to who knows where. As long as it's not my doctor's surgery. so let's hope it's one of our secret weapons today. because this is a general sale. I've put around the ?100 mark on it. ?150. I'm hoping the buyers will be here. Cross our fingers. It sells here in the room at 95. Is the phone bidding? ?95. That is a good result, isn't it? Only ?5 off Jonty's lowest estimate. we need our remaining items to be a hit. the uniformed Pelham puppets will hopefully reach at least 30. ?20 to start. 20 I am bid. 20, I sell on the maiden bid 20. 40. 42. 42 at the back. Fill it up to 50. 50. At 50. 55. Behind you at 55. I sell against you in the blue. Goes with the lady at ?55. Finished at 55. All done at 55. ?55. That is a good result, isn't it? The auctioneer was really stringing them along! Julie's floor refurbishment, we are on a roll. our next fabulous lot takes to the stage. Next up the pair of Doulton vases. How do you feel about these going? because I worry about them. Why do you worry about them? Getting broken. I would rather they went and somebody else enjoyed them. Erm, ?20 for them. 20. Tenner. Ten I am bid. 28, 30, in the doorway at 30. I sell them in the doorway at 32. 32 now, new money at 32. Back down here at ?40. I sell to the lady at 40. Make no mistake. They're going at ?40. I will take two if you like, sir. Bidding? At ?40, I sell down here at 40. ?40. That's half your estimate. if we're going to make that ?600 target. worth its weight in gold, to the sum of ?150 to ?250. because I have been through the family photograph album. you remember it for ever in the house. And now it has been it's being sold, the bookcase. 20 I am bid. At 20. I sell at 20. 25, 28. 30. 35. 40. 45. At 45 now. At ?45. Is that it? You all finished at 45. Fill it up to the 50, sir. Finished with it at 45. I don't think that's enough. We'll try that one somewhere else. If you won't go 50. At 45. You're out in front. Done at 45.
and he will try it in another auction sale. Rather than sell it for ?45, which does seem ridiculous. off the ground we can't afford any more like that. still in their in presentation boxes goes under the hammer. What do you want for the whole lot? I put ?80 to ?120 on the collection. But what makes it so lovely is the fact they are all still in cases. First bidding on this, 40, 45, 50, with me at ?60. Sold to the lady at ?210. Julie, ?210, are you pleased with that? Really pleased. As long as it's tears of joy. Yes, that was brilliant. Very good. to cover our previous poor sales? Right, that's the end of the auction as far as we are concerned. It has been an interesting day. Great results, that silver was fantastic. We wanted to raise ?600 so we can get the parquet flooring sorted out. Do you think you made that amount? It's hard to tell, you can't tot up as you go along. The good news is I think you will be all right. Well done. That is brilliant. Really good. And that is pretty good considering the bookcase didn't sell. Well, we will probably need more money in our pockets. I am taking the boys away while Alan gets on with the work. The Isle of Wight on a group holiday. We go every year with family and friends. while leaving Alan behind to complete her floor transformation. to reveal the parquet flooring which Julie loves so much. she can't help wondering what is happening in her absence. and we will be really pleased when we get home. but Alan is relentless and wants to get the best results for his mum. the brand-new floor and find out what Julie's verdict is. Very smart aren't we, Lee? Lovely. Thanks very much. Just a bit of decorating to do now. the whole thing has been really good. Julie Carter's home is in need of a makeover, and she particularly wants her parquet flooring to be restored to its former glory. Luckily her son is something of a handy man, so the labour is all paid for. Now the Cash in the Attic team are called in to hunt out enough collectables to sell at auction so all the materials can be paid for. As Julie is going on holiday soon her son wants the house finished by the time she gets home!